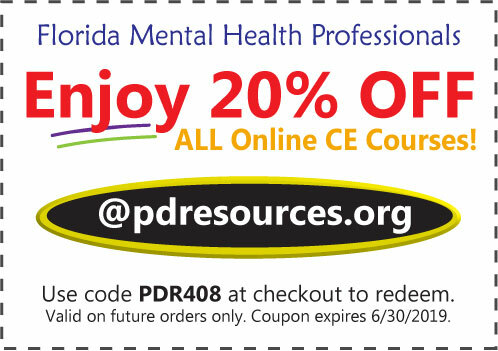 Florida counselors, social workers & MFTs can earn all 30 hours for license renewal through online courses offered @pdresources.org. Save 20% now! We report to CE Broker for you – so you don’t have to! All courses are reported within a few days of completion. Click here to save 20% on online CE courses! This entry was posted in CE Requirements, Mental Health and tagged @pdresources.org, CE, CE Broker, CE requirements, CEUs, continuing education, domestic violence, ethics & boundaries, Ethics & Boundaries in Psychotherapy, Florida, Florida Board of Clinical Social Work, Florida Laws and Rules, Florida mental health, Florida Mental Health License Renewal & CE, License Renewal, marriage & family therapists, mental health counselors, MFT & Mental Health Counseling, MFTs, Online Courses, Preventing Medical Errors, Preventing Medical Errors in Behavioral Health, Professional Development Resources, Social Workers by Gina Gunderson. Bookmark the permalink.